The onset of the monsoon has inspired the small bamboo to start shooting. Shoots are sprouting up within the grove and all through the lawn metres from the grove. Apparently, a good way to control bamboo is to eat it. 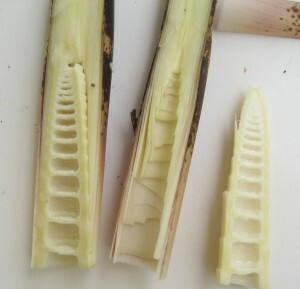 For the variety of bamboo being harvested here, I found the optimum size of the shoots to be about 20 cm high. Any smaller and the yield is a mere mouthful. Any larger and the shoots start to get a bit fibrous. There are some helpful instructions for peeling and cutting the shoots in this short YouTube vid posted by Suburban Foragers. 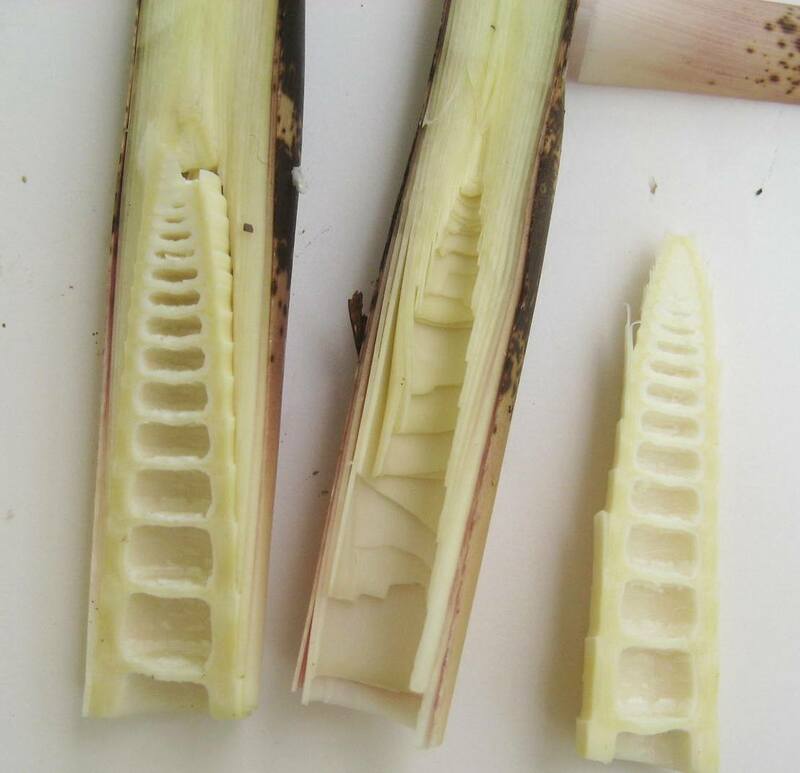 The inner heart of the bamboo should be soaked, or boiled, or both, depending on who is telling the story. I do not have the definitive answer on this. Some folk say the soaking and/or boiling is to remove the bitter taste and some say it is to remove the hydrocyanic acid present in some varieties of bamboo. Even though the bamboo I’m using is not bitter when raw, I opted for a just-in-case method and soaked AND boiled the shoots. The shoots were soaked overnight in water, and then boiled for 20 minutes. Bamboo shoots will keep for up to two weeks covered in the water in the fridge. Change the water daily. Or freeze the prepared shoots. The first batch of shoots that I harvested, were just dropped into a butter chicken dish near the end of cooking. As a vegetable, the shoots were delightfully crisp and tender. Nutritionally, they are good source of dietary fibre, potassium, and some other minerals. The dogs love them too, raw, if I peel the outer leaves off for them. And the horses. Soon I’ll post some bamboo shoot recipes. 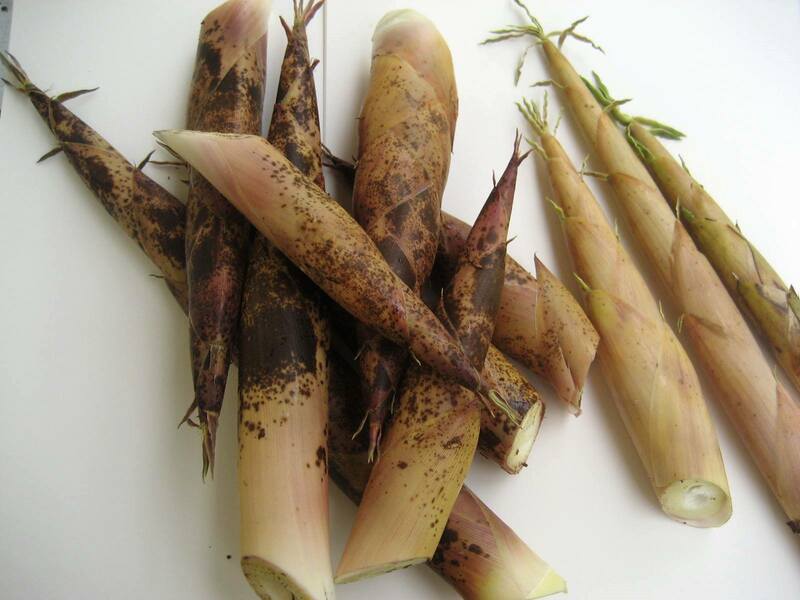 Do you have a favourite bamboo shoot recipe? This entry was posted in Bamboo in the garden, Food, Home and Health and tagged bamboo, bamboo maintenance, bamboo shoots, food, harvesting bamboo, health, recipes on 04/12/2013 by Deb.